The Backwoods Engineer: Is Strict Scrutiny Really a Trojan Horse to Defeat the RKBA? Is Strict Scrutiny Really a Trojan Horse to Defeat the RKBA? UPDATE 11/5: Amendment PASSED! But Bama Carry's gripes continue! WELCOME Sipsey Street & War on Guns readers! There's an update to this story here at The Backwoods Engineer. Also, please check out my other posts when you're finished with this one. I don't understand the opposition to the ballot measure for Amendment 3 in Alabama, which would direct judges in the state to apply strict scrutiny to cases where the state's compelling interest is opposed to the individual and fundamental right to keep and bear arms. For example, the Bama Carry organization, both at the state level and local chapters, have had officers tell their members to vote NO on Amendment 3. Ol' Backwoods heard this personally at the Bama Carry Rivers Region chapter meeting this past Monday in Elmore County. Why? Is strict scrutiny really such a Trojan Horse that it will bring the loss of our right to keep and bear arms? Prominent 2nd Amendment attorneys, who work cases at both the federal and state levels, advocate for strict scrutiny for the RKBA. For example, Alan Gura (who won Heller v US and McDonald v Chicago) has argued extensively for strict scrutiny (as in Nordyke v King in CA:http://www.saf.org/?p=1656). I think those who oppose the mandate of strict scrutiny in RKBA cases misunderstand how this works. This is not about the legislature, but about the judiciary. The judiciary has to decide between two interests in all cases as regard fundamental rights: 1) interest of the individual, and 2) interest of the state, or the people, as perceived by the judge(s). What gun-grabbing judges will do is say that the interest of the people is that nobody should have a gun. This just happened in North Carolina, with Judge Stephens ruling no concealed carry at NC state fair, in clear contravention to a law barely a year old, explicitly allowing carry at events requiring admission. How these things get decided in courts depend on the level of judicial scrutiny: rational basis, intermediate scrutiny, or strict scrutiny. With a strict scrutiny amendment in the AL Constitution, judges receive instruction that all cases involving fundamental rights must apply strict scrutiny to state interests that come in conflict with an individual's fundamental rights (here, the RKBA). Here is a quote from Superior Court Judge Donald Stephens of NC, who does NOT have to apply strict scrutiny to a case regarding the fundamental right to keep and bear arms. He can tell peaceable gun owners to pound sand, you can't carry at the state fair in NC, in direct contravention to the clear language of the law: "... if there is some way I can interpret these statues to prohibit [carry at the fair], I will." You bet he will. 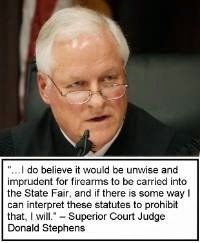 And so will other anti-gun judges, unless they are reined in by the people. The judges have been inculcated with hatred of the right to keep and bear arms in the law schools, most of which still teach, contra Heller, that the RKBA only applies to the militia, and that is the National Guard. Look, this isn't a cure-all. An amendment enjoining strict scrutiny is just a start. Judges will still rule against fundamental rights. Those that do should be impeached; but, there first must be a basis in law for them to be impeached. Which returns us to the need for strict scrutiny in Alabama's Constitution. In short, the Second Amendment is part of normal constitutional law. The standard of review is not the absolutist “What part of ‘shall not be infringed’ don’t you understand? '” Nor is the standard “reasonableness” as a euphemism for “rational basis so long as all guns are not banned”; nor the weak “undue burden” standard that was invented for one particular un-enumerated right which is an extreme outlier in the weakness of its basis in history, tradition, and other sources for u-nenumerated rights. Intermediate scrutiny does apply sometimes, as with the First Amendment, and, also as with the First Amendment, stricter scrutiny applies at other times. As with much of the rest of 21st century constitutional law, the interpretive methodology includes both originalism and a practical analysis which some persons would call “living constitutionalism. So why not mandate strict scrutiny then, Alabama? One objection is "if it is not broke, it does not need to be fixed or changed." I read this exactly on one of the Alabama gun rights groups's Facebook page. Well, it's plenty "broke" now! There are plenty of infringements of the right to keep and bear arms that exist in Alabama law, and have been upheld by courts. For example, an Alabamian cannot carry in his or her car without a concealed carry permit, which is a clear infringement of the right to keep and bear arms. But no court challenges have been brought to this. My guess is, the lawyers know the case would never succeed, because the judge would apply rational basis or intermediate scrutiny, and agree with the Alabama Sheriff's Association and "Boss Hogg" Marshall of Montgomery County, and say "You lose! Get a permit from the county if you want to carry! NEXT CASE, Bailiff!" Thus do they infringe our fundamental rights unless told otherwise. There are other infringements that are just now beginning to be challenged in Alabama. The Students for Concealed Carry on Campus this year are challenging the total ban on concealed carry on the University of Alabama campus. Now, under what standard of review would a judge in that case rule in favor of the Alabama students' fundamental right to bear arms? On a rational basis? Nope. That would lead most judges, who are already biased against guns from way back in law school, to say, "Ban upheld, state has a compelling interest of safety. NEXT case!" How about an intermediate scrutiny basis? It's doubtful; few RKBA cases have been won on the basis of that level of judicial scrutiny. Only strict scrutiny would win the day, and only if the people can compel the judge to apply it. Amendment 3 would be a good start. Another so-called argument against Amendment 3 that I've read is this: "Well, the 1901 Constitution says no law or court can infringe the right to keep and bear arms, so what part of that can't you understand!!" Despite its blustery emotional appeal, this is not actually an argument; it is called "begging the question", since the sufficiency of the language in the 1901 Constitution as regards the RKBA is what is at issue here. Just blustering over and over, "what we have now is good enough!" does not make it so. Why don't the opponents of Amendment 3 bring a cogent argument to the table that condemns requiring the judiciary to use strict scrutiny when deciding between an individual's RKBA and the government's interests ? Because there aren't any good arguments against strict scrutiny, or against Amendment 3. I maintain that those that oppose the legislation of judicial strict scrutiny to state interests opposing fundamental rights do not understand it. And here's one of the worst things: if Amendment 3 goes down in flames, you can bet the enemies of freedom like Bloombers and CGSV will crow about it as if it was their own personal victory. Bet on it. This whole business of applying various levels of "scrutiny" in using a "compelling government interest" to trump a right is the purest BS. Government is an agent, not a principal, and cannot have interests of its own. But very few Americans have heard about that distinction. Even fewer understand it, which is why the Omnipotent State gets away with so much in these waning days of the Republic That Was. Very well stated. Thanks for bringing that to everyone's attention. Help me out here, Fran. What is the right thing to do on this Amendment 3, then? Vote it down? Deny ourselves any measure of judicial protection? Let the anti's have a party over a major gun rights ballot measure going down in flames in the Deep South? Or affirm what is already taking place, namely, various levels of judicial review, and direct judges to apply the highest level when dealing with one's fundamental rights? How about insisting that a genuine right is an absolute possession of every individual not under penal limitations imposed by a jury of his peers in accordance with legitimate law? That's the original (and still the correct) meaning of the word right. I know, I know: I'm a retrograde dreamer fool idealist blathering out the top of my head.. But I insist that words be used according to their proper meanings. If a "right" is not absolute, it is a permission -- and a permission can be withdrawn by the granting authority, for any reason or none. 'strict scrutiny' is another of those phrases that is designed to confuse the target audience; in reality, it means that the government will decide on what it deems permissible and impermissible, and yes, that does mean it trumps your Constitutional rights. The regime hopes that people will support it and think that 'strict scrutiny' is their saving shield. But those who like the Constitution will indeed vote no. I don’t think strict scrutiny as a constitutional requirement necessarily hurts, but what proponents fail to recognize is that judges are human and as such resent being told what to do. When they’re contradicted, just like petulant children, they rebel by any means they can. If you look to examples - the 4th US Circuit in Masciandaro and LA judges after being required to review with strict scrutiny, you see what will happen. Judges will simply say, we applied strict scrutiny and the restriction passes muster because the state has a compelling interest. Even though Heller and its progeny have classified the 2A as a fundamental right, that change did not magically change the minds of all the jurists in the judiciary. All it did was polarize the 2 camps of supporters of 2A and those who deeply believe that 2A is in the constitution but should be completely ignored. The answer here is act legislatively. When courts rule stupidly, overrule them by changing the relevant laws. Until / unless these judges retire or leave the bench, we will continue to have these oddball rulings. You keep doing this until or unless you stamp out all of the judicial stupidity. Relying on the courts is a false promise; the judiciary is separate and equal branch OF the government and as such has a vested interest in preserving government power. Alabama's firearms rights are already fundamental rights as enshrined in the State Constitution. Amendment 3 would take that away and make Alabama firearms rights a government granted right. So Alabama would be going backwards. That is why I intend to vote no on Amendment 3. See my statement above about begging the question. The clear statement of 'strict scrutiny' provides a weapon against those judges who would deny it. It is, in essence, the only way we have of re-passing the Second Amendment with some kind of codicil that says 'We really mean it." We have to try. It might not work, but Louisiana and Missouri have shown us the way. When it comes to gun laws, we have SPECIFICALLY the right to keep and bear arms, according to the Constitution. Any laws contrary to that are BY DEFINITION unconstitutional, and the antis, according to the Constitution, have NO RIGHT to infringe on them. When it comes ultimately to the question of confiscation, though, we have a weapon in our hands, while they are holding only a piece of paper, and the thugs that they send to confiscate our weapons will be fighting on OUR home turf. Given that the design purpose of a republican government is the security and defense of the rights of individual citizens, there can, by definition, be no such thing as a compelling purpose or interest which overrides said rights. Such a concept would be the textbook definition of a category error. Tell it to the lawyers. They have been doing this for 150 years. So, when are we going to start reining them in, and the judges?